Japanese people are a lot more aware of the seasons than Belgian people are. While the first signs of spring are met with joy everywhere, Japanese culture takes it to another level by singling out a great number of tell-tale sings of spring that people can look for and rejoice about. Famous examples are the first cry of the uguisu (a little bird, called the Japanese bush warbler in English) and the first blossoms, which are usually ume (plum blossom). But even the less glamorous signs of spring are noticed and welcomed with open arms. Like the inconspicuous little plant called tsukushi (土筆) or field horsetail. This little plant pops up by the side of the road all over Japan in early March. It was first brought to my attention by my lovely English students. They are a group of senior citizens and they still recall the days when people used to eat this plant. It was an inexpensive food source in times when Japan was not yet the land of plenty that it is now. I also noticed the Field Horsetail on the wonderful Facebook page ‘Seasonal food in Japan’. Apparently the page is owned by a Japanese company that produces the ‘Taste Calendar’ (味のカレンダー). Their website appears to be in Japanese only but their Facebook page sometimes contains information in English. 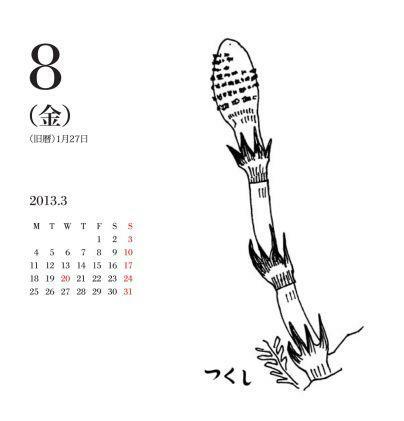 I wonder if the inclusion of the Field Horsetail in such a trendy calendar means that it is gaining in popularity again. In Belgium, there is a trend of bringing ‘forgotten vegetables’, such as parsnip or celeriac, back the daily menu. It would be interesting to see a similar trend in Japan. 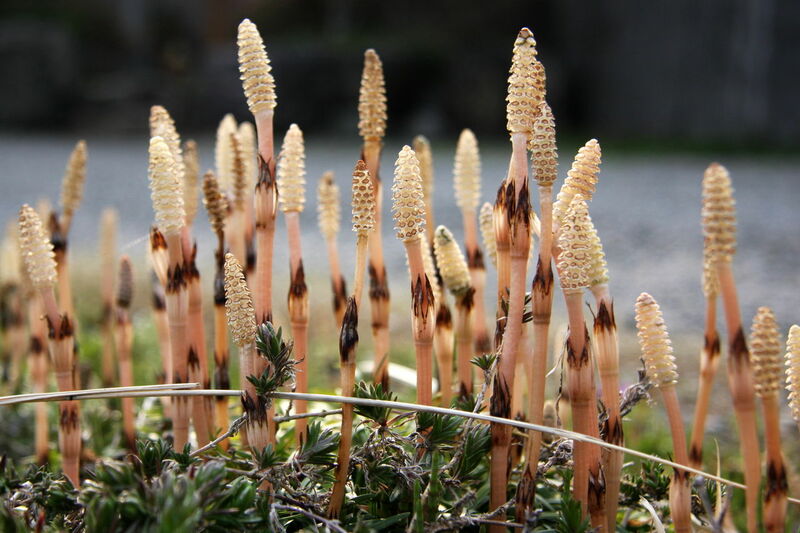 Last year the horsetail was assigned to the 8th of March on the Japanese Taste Calendar. This entry was posted in Culture, Food, Japan and tagged Belgium, English class, Field Horsetail, Food and drinks, Food culture, History, Japan, Japanese culture, Old Japan, Spring, The seasons by Haruko-chan. Bookmark the permalink. wow. this is a surprising education for me. i’m a fountain pen user and so i regularly use a fountain pen ink. the japanese pen company Pilot produces a high-end fountain pen ink line called Iroshizuku Ink. one of the colors is called Tsukushi, which has a nice rich medium brown color. i know the translation of Tsukushi means horsetail, but i had no idea that it is in fact a plant called field horsetail. i had always thought it means an actual horse tail. so thank you for sharing this post. now i know. This is really interesting for me as well. I love fountain pens and the ink sounds interesting. Are you particularly interested in Japanese fountain pens, or all kinds of fountain pens? all kinds. but more drawn towards the japanese brands. only because japanese nibs tend to be finer than the european ones, which works best for me as i write small. How do they taste? They don’t look very appetising, but I’ve learned that you shouldn’t judge a food by its appearance (like blue cheese for example, yummy!). Nothing much but we tend to make ohitashi out of these grass-like vegetables using dashi so I suppose that’s what you would taste. I love this! They look a bit like odd asparagus! Haha Thank you for the links – I love learning about seasonal food and flowers. Then you are in luck because Japan is the mekka of seasonality ^_^ We have the same seasons in Belgium as well, but somehow they feel so much more pronounced and more beautiful in Japan. I wonder if that is due to nature itself or due to the eye of the beholder (i.e. Japanese people maybe just pay more attention to it?). I wonder that myself too! We also have seasons in the US as well, but I never noticed the small details as much until I came to Japan. I always wonder if Japan is so unique or if my world view changed! How about you? What do you think? That’s true! It’s amazing how they plan the landscaping around the cities and parks so that there’s such picturesque seasons! I’ve heard in many places about how these signs of spring are edible, and although it makes me curious, I have yet to try eating them! Not sure where I’d start, or even if I’d be allowed to pick them off public property. I think it’s ok to pick them off public property. If they are just growing by the side of the road or at the edge of a field… I think the student that gave them to me, picked them from his own field, where they were considered weeds.